YRA was established in 2002 as an independent legal entity under Madhya Pradesh Society Registration Act, 1973 with an objective to address development issues of marginalised and underprivileged sections of society in western India. The inspiration behind formation of YRA has been YUVA, a voluntary organisation established in 1984 to empower the oppressed and marginalised in urban areas. YUVA observed that the roots of the condition of urban poor were related to the inequity and economic insecurity in rural India and sensed the need to form YRA to take responsibility for rising concerns in rural areas. YRA initiated interventions in Gujarat, MP and Maharashtra. However, due to lack of local leadership the interventions in Gujarat and MP were terminated and the focus was shifted to Vidarbha region. YRA is currently implementing its fourth strategic plan for the period October 2011 to September 2014. Headquartered in Nagpur, YRA has project offices in four districts - Akola, Bhandara, Buldhana and Wardha. For the past 10 years, YRA has been contributing towards sustainable development process through socio-economic and political empowerment of the marginalized, underdeveloped and rural/tribal communities. Foreign Sources: In FY13, foreign contributions were 48% (Rs4mn) of total income. Oxfam and SWISS AID were major sponsors contributing Rs2mn each, leading to sharp increase in foreign funds from Rs0.7mn in FY12 to Rs4mn in FY13. Non-Government Funding Agencies (NGFA): Funding from NGFA amounted to 26% of total income in FY13. The increase from Rs0.5mn in FY12 to Rs2.6mn in FY13 is on account of contribution by UNICEF to the tune of Rs2mn. The Government has notified UNICEF (and 127 other organisations) as non-foreign sources; hence these are taken under NGFA. Government: Contribution from Government sources declined from 44% in FY12 to 16% of total income in FY13. However, in absolute terms, Government funding has marginally increased from Rs1.2mn in FY12 to Rs1.6mn in FY13. (Refer Fig. 1). Programme Expenses: Expenses totalled Rs10mn in FY13 with expenses to the tune of Rs9mn (91% of total expenses) incurred on programme activities. 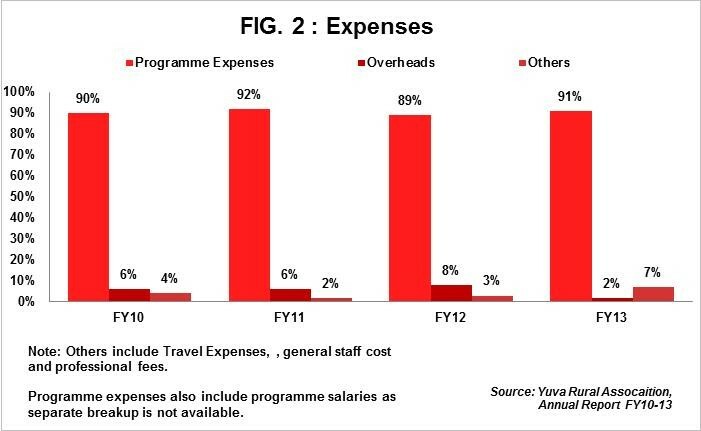 YRA has incurred programme expenses in the range of 89%-91% during FY10-FY13. Programme expenses also include expenses incurred on staff salaries as separate breakup is not available. Overheads: Expenses on overheads have declined to 2% of total income in FY13. The decrease from Rs0.2mn in FY12 to Rs0.18mn in FY13 indicates improved utilisation of funds for programme activities. (Refer Fig. 2). Current Assets excluding Cash/Bank: In FY13, current assets accounted for 29% of total assets. Grants receivable and advances to the tune of Rs0.4mn each are included in current assets for FY13. Cash/Bank Balance: Bank balance has increased from Rs0.7mn in FY12 to Rs2mn in FY13. This increase can be attributed to donations received during the year but still unspent. Trust Corpus: YRA has maintained a marginal Trust Corpus of Rs0.2mn during FY10-13 constituting 7% of total funds. Earmarked Funds: As a general practice, grants received by YRA are not routed through income statement but are reflected as Earmarked funds in balance sheet. Earmarked funds comprise of grants unutilised for the year and account for 89% (Rs3mn) of total funds in FY13. Income Growth Rate: YRA posted total income of Rs10mn in FY13. The organisation has recorded a growth rate of 245% in FY13 as compared to negative growth rate of 4.8% in FY12. 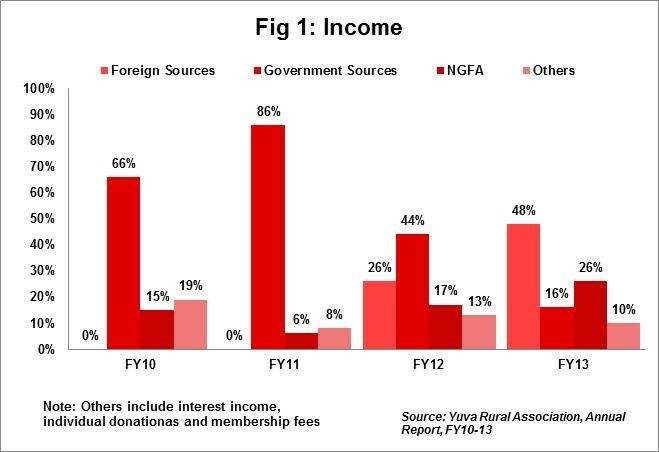 Substantial funding from NGFAs and foreign donors in FY13 led to significant increase in income. Our income figures include Rs8.5mn (86% of total income) which have been utilised during FY13 from unutilised grants received in the previous year and grants received during FY13. Self-sufficiency Ratio (SSR): Self-sufficiency ratio is 9.7%. The ratio measures ability of an organisation to meet expenses from its own funds. Own funds include individual donations, interest income and beneficiary fees. The ratio is low as own funds account for only 10% of total income in FY13. Dependency: YRA largely depended on government funds in FY10 and FY11. However, FY12 and FY13 witnessed decline in government funds with a proportionate increase in other sources of income. This indicates that YRA has diversified sources of funding. Coverage: Through the project offices in four districts, YRA has implemented projects in 11 districts of Vidarbha region. Retaining Donors: Though the ground reality is completely different, Maharashtra state has been perceived as a relatively developed state by donors. On this pretext, the existing donors are gradually withdrawing their funds. YRA is thus struggling to convince the existing donors about the severe need of funds for improvements required in the state especially in Vidarbha region, which is one of the most backward regions in Maharashtra. High Attrition: YRA faces issue of high attrition of human resources and lack of dedicated and skilled personnel at ground level. Bureaucracy: Inadequate allocation of budget by the Government has resulted in a challenge for YRA in implementing its projects. The schemes implemented by Government are not reaching the actual beneficiaries on account of high level of bureaucracy and corruption, making it difficult for the NGO to meet the gap. YRA has board members from diverse background with a rich experience of about 25-30 years each in the social sector. The President of YRA currently heads the CSR division of Suzlon group of Companies. Dr. Saldanha, a member of governing council, heads the Unit for Sociology for Education in TISS. The Board meets thrice a year or as and when required. YRA is listed with GuideStar India and has applied for listing with Credibility Alliance.